One of the most important aspects of training is documenting what you do. Keeping track of your runs keeps you updated on what you've done, where you are currently at, and how to plan for the future. It allows you to easily calculate your weekly, monthly and/or yearly mileage. 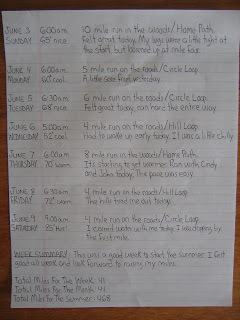 You can use the running log to record workout specifics, race results and even shoe mileage. In other words, it can be as detailed or basic as you want it to be. Nice advice. You should add Athletic.net to your list of running site links.